Wall murals have became popular in the graphics world with more people that are wanting to add a distinctive characteristic to a plain wall. This form of art is not only common in businesses but is also sparking interest in homes where maybe a painted wall is just too bland. Recently Fast-Trac Designs put up a wall mural for a customer of ours, I-17 Auto Recyclers. They are a local business that wanted to add to the atmosphere of their shop to make them stand out. Fast-Trac Designed printed their mural on 3M ControlTac and laminated with gloss laminate. Their design is the logo and website, fairly basic; however more than enough to grab attention. Now, since we are on the topic of the way cool murals lets go back to about March of 2013. Fast-Trac Designs created a custom wall mural for a garage. 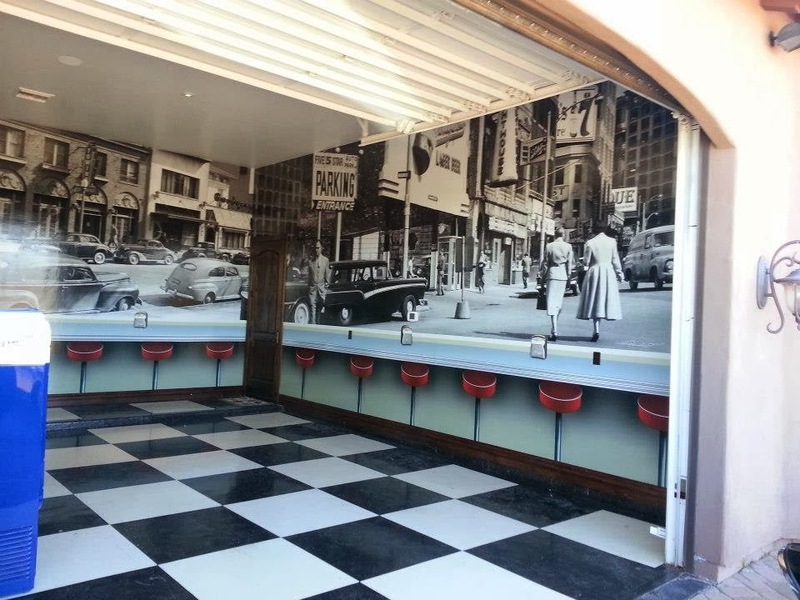 The mural gave prominence to a 50s themed street and diner. This mural was also printed on 3M ControlTac but laminated in a matte finish laminate. Check out the photos below and if you have an idea for a wall mural for home or business just contact Fast-Trac Designs. Every year Fast-Trac Designs custom screen prints t-shirts for the annual Moparty in the Desert mopar car show. The shirts had a one color printed left chest and a six color back that featured vehicles of Mopar club member and club sponsors. Fast-Trac Designs is on the road every day with their wrapped vehicles and you can't miss them. The Fast-Trac Designs truck wrap features bright, neon colors and flames and appears to be lit up with how bright these colors are. The other vehicle that is decked out with Fast-Trac Designs is a car with a comic book theme. The classic "POW!" and "BANG!" are displayed throughout the design except they feature different services that are provided by Fast-Trac. With the Joker on the back window and this action packed wrap, Fast-Trac Designs turns a lot of heads. 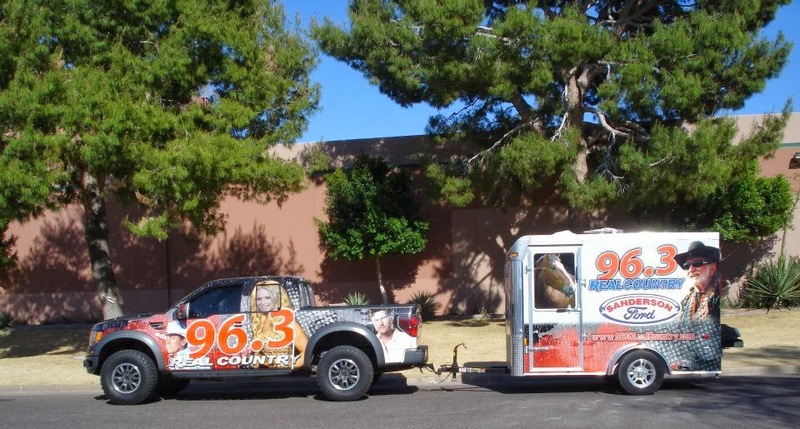 96.3 Real Country is a popular country radio station in Wickenburg and in Phoenix, Arizona. Their wraps feature popular country artists with an abstract background. The two truck wraps and the trailer wrap were all designed, printed and installed by Fast-Trac Designs. There is a really good chance you will see these popular vehicles around town and at concert events. Fast-Trac Designs had the wonderful opportunity to create monster graphics for a custom Hummer. The Hummer featured a theme of "Gray Hulk" that Fast-Trac Designs brought to life with custom 3M vinyl graphics. The Gray Hulk Hummer was displayed at Fast-Trac Designs Oktoberfest and at SEMA 2013. Fast-Trac Designs has several loyal customers that have been with them for years, some even when the business was still from home. We thought it would be personable to include them in our blogs that we started last April so lets take it back to an ambulance wrap done in December of 2012. Our customer FSEC has had a great deal of products done by Fast-Trac Designs so of course when they wanted to wrap an ambulance they knew the perfect place. Fast-Trac Designs created a distinctive wrap that included vivid color and all of the information for FSEC. Overall our long time customer was more than pleased with the finished vehicle wrap. Fast-Trac Designs can add another quality job to the resume and you could say it makes us more swift and takes us to the top. 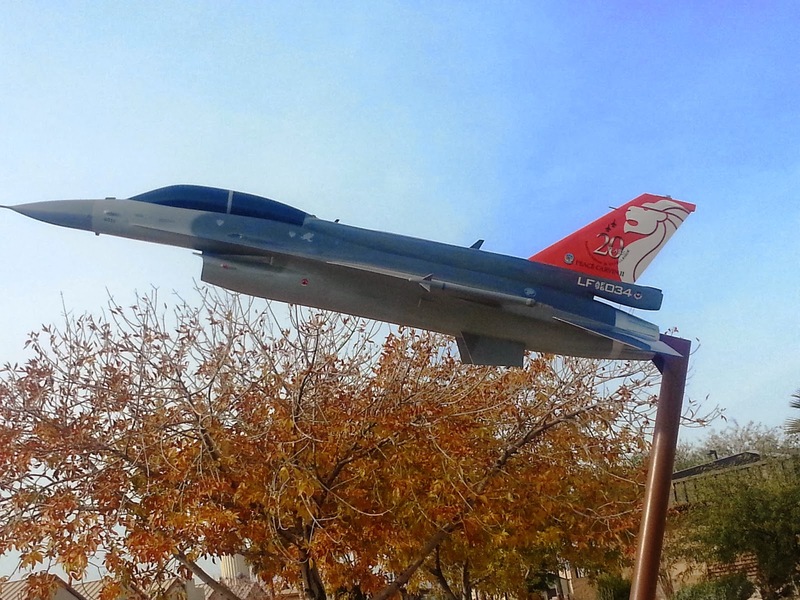 If you have read our previous post on the F-16 Jets those photos were just models and this is the real deal. How high are we talking? way, way up to 50,000 feet, and did we mention fast? We are hitting mach 2 speeds! If you have ever been to Lake Pleasant Harbor then you are familiar with all of the signs that they have posted throughout the area and you may have noticed that they are a bit worn. Well, soon enough all new, revamped signs will be posted to aide lake-goers in direction and to help enforce the rules of Pleasant Harbor. You know what that means, Fast-Trac Designs is up to our ears with signs to produce. 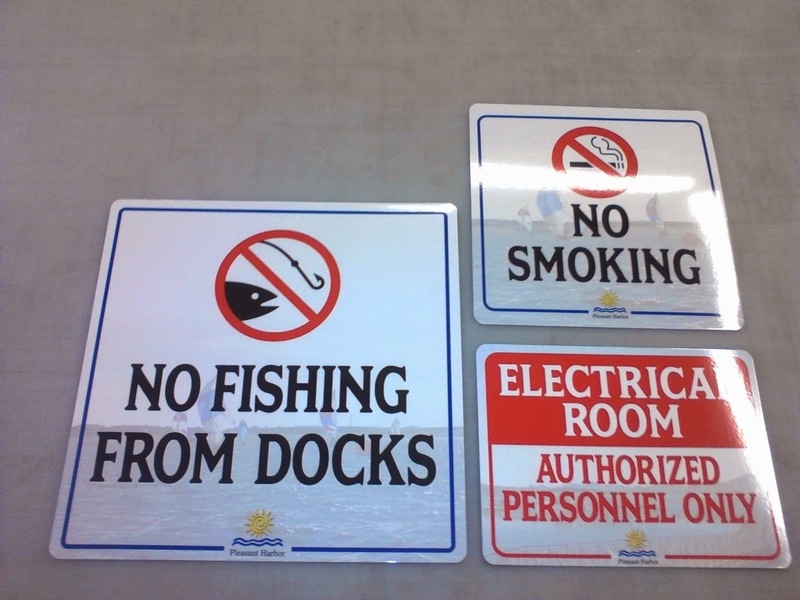 We are just getting started but when all 280 signs are installed Lake Pleasant Harbor will have a whole new look. Wrapping a fleet of vehicles is a lot of work with a wide range of vehicle body styles including two 26 foot box trucks, one 28 foot box truck, an F350 4-door long bed pick up truck, and a 2013 Ford Transit. Fast-Trac Designs has had hands full of wraps, wraps, wraps! 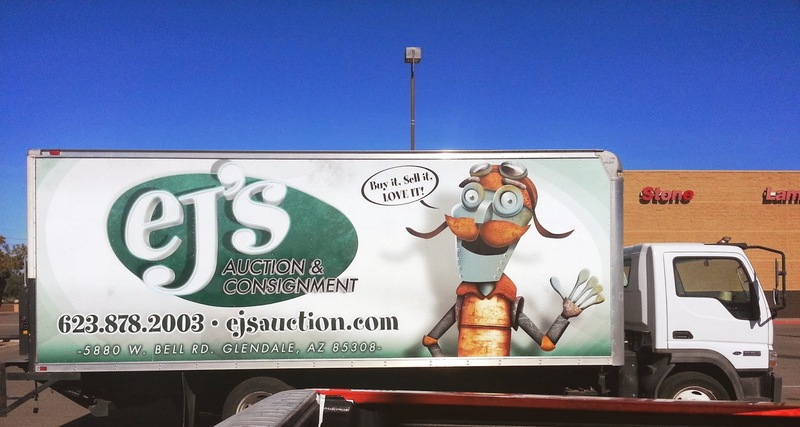 The fleet of vehicles is for our customer EJ's Auction and Consignment. The Design features a fun font, subtle green shade and a friendly character that is announcing their slogan. We have more photos coming as the wraps are completed, keep a look out for updates! Fast-Trac Designs reels in yet another unique wrap project that will change the skies. 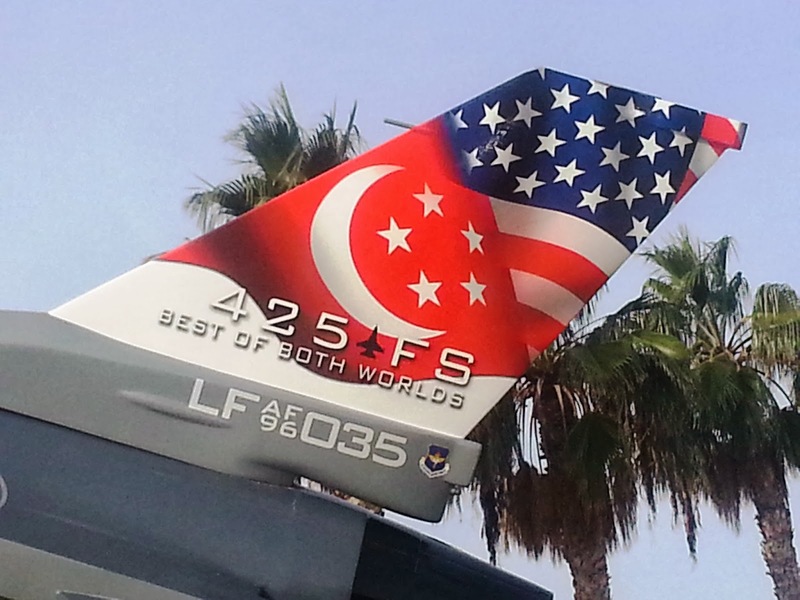 We were contacted by Luke Air Force Base that is here in Arizona and they were in need of several wraps for their F-16 Fighter Jets that are used for the U.S. Singapore Military. We used laminated 3M Control Tac wrap material and did the installations on base. Keep in mind that these are just the model versions and the real deal will be posted soon.